Krakatoa on Saturday night’s “All the World’s a Stage” concert! I’m back in Champaign this week for more residence activities with the Champaign-Urbana Symphony Orchestra, and I am looking forward to an EXPLOSIVE concert this Saturday night at the Krannert Center for the Performing Arts! Why EXPLOSIVE, you ask? Because Maestro Stephen Alltop is welcoming violist Carol Cook to Foellinger Great Hall’s stage to perform Krakatoa, my EXPLOSIVE viola concerto! Composed in 2017, my concerto traces Krakatoa’s volcanic eruption in 1883 (see my program note below for detailed information about the eruption). I scored the solo violist to be accompanied by string orchestra and a wide battery of percussion instruments. The work received its world premiere one year ago in a performance given by the Bandung Philharmonic in Indonesia (where Krakatoa is located) with Maestro Robert Nordling at the helm and violist Michael Hall as soloist. Ironically, when composing the piece, I specifically chose a volcano that hadn’t had a major eruption in over 130 years, thinking that Krakatoa wouldn’t likely have another big episode any time soon. So I was taken aback earlier this year when Anak Krakatau (“child of Krakatoa,” which formed from the remnants of Krakatoa) exploded in a series of large eruptions this past December that has once again led to the collapse of its crater to a quarter of its pre-eruption size. The damage done by Anak Krakatau wasn’t nearly as catastrophic as its predecessor, although there were over 400 lives lost and the destruction of property when Anak Krakatau’s eruption triggered a tsumani that reached the region’s coastal cities. For more information about Saturday’s concert, please visit https://cusymphony.org/. Come join us for an EXPLOSIVE concert this weekend! On May 20, 1883, a cloud of ash rose six miles high above Krakatoa, a volcano nestled on an island in the Sunda Strait between Java and Sumatra. For the next two months, the volcano rumbled and spewed occasional dust and debris into the air, giving nearby inhabitants a spectacular show. On August 26th, Krakatoa turned deadly with an enormous blast that spewed pyroclastic flows (a blend of ash, lava, and gases) and pumice (lava that mixes with water and solidifies quickly into rock), and commenced a series of eruptions. On the next day, the volcano produced four enormous eruptions over four and a half hours. These eruptions were so loud (particularly the fourth) that they could be heard 3,000 miles away, and so devastating that two-thirds of the island sank back under the sea. The effects of Krakatoa’s eruptions were staggering: they sent shock waves into the atmosphere that circled the globe at least seven times; they triggered numerous tsunamis, the highest nearly 120 feet tall, which flooded and destroyed 165 coastal villages along with their inhabitants; and they propelled tons of ash roughly fifty miles up into the atmosphere. This ash blotted out the sun in Indonesia for days; it also lowered global temperatures for several years afterwards, and produced a wide range of atmospheric colors and phenomena. At least 36,000 people tragically lost their lives that fateful day. For the next forty-four years, Krakatoa was silent below the sea. This silence ended in 1927, when fishermen spotted steam and debris rising from the island. 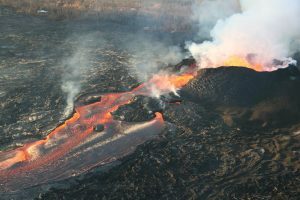 Within a year, a new volcano began to take shape above sea level. This new volcano is named Anak Krakatau, which translates to “child of Krakatoa,” and periodically experiences small eruptions. Krakatoa for solo viola, strings, and percussion follows the path of the volcano’s four main eruptions. 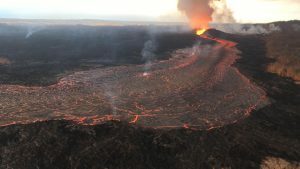 In the first movement, Imminent, the violist uneasily plays as the orchestra (representing the volcano) shows ever-increasing signs of awakening. The orchestra bursts forth into the second movement, Eruption, where it proceeds through four eruptions that get progressively more cataclysmic. After the final and most violent eruption, the violist plays a cadenza that eases the volcano into the third movement, Dormant. In this final movement, the volcano slumbers, soothed by musical traits that I borrowed from traditional Javanese gamelan music: a cyclical, repetitive structure in which the largest gong is heard at the end of each cycle, and a musical scale loosely based on the Javanese pelog tuning system. The movement ends peacefully with an array of string harmonics, representing the intense and brilliantly colored sunsets generated by Krakatoa’s ash in the earth’s atmosphere. Krakatoa was commissioned by the Barlow Endowment for Music Composition at Brigham Young University. *Please note that the photos are of Kilauea, not Krakatoa, for copyright reasons.